Everything is set for the premier sprint race in Queensland racing this weekend, as the $650,000 Doomben 10,000 fast approaches. A strong field of runners has been accepted for the race, which attracts plenty of interest from the top horses and trainers in Australia every year. This year is no different, as a closely matched field prepares to go to the gates, which will take on added importance for Saturday’s race, due to the tight turns normally associated with the Doomben Racecourse. 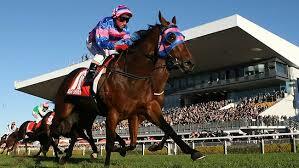 The best place to have a bet on the 2014 Doomben 10000 is with Bet365.com. The odds below were taken from the site, and you will be able to find the latest race odds there as well. Bet365.com is also offering each-way betting on the race, with which you will receive 1/4 if should your selection place in positions one to three. Saturday’s race looks as though it could be a rerun of the BTC Cup run in Doomben a couple of weeks ago, as the horses that occupy three of the first four lines of betting ahead of the race finished in the first four places in that race. The winner that day was Noel Mayfield-Smith’s Famous Seamus, followed by Sprit Of Boom, Buffering and Temple Of Boom. This time out it will be Robert Heathcote’s Buffering who will start the race as favourite, who is a proven champion but will have been disappointed with his effort in the BTC, where he faded in the last 200. His previous race didn’t go very well either, with another third place in the TJ Smith Stakes. He has it in him to improve on those performances, but he will have to bring his best game if he is to beat this strong pack. Marginally installed as the second favourite for the race is the Gary Portelli-trained Rebel Dane, who heads into the races having been through the same preparation that saw Epaulette to the race win last year, even though his performances in those races weren’t altogether exceptional. He ran a very good second in the TJ Smith Stakes, but lagged in fifth in the Group 1 All Aged Stakes. Tony Gollan’s Spirit Of Boom will also be one to look out for, whose consistency is always a strong draw card for punters. He will be comfortable with the distance, and with two second places finishes from his last two starts, in the Victory Stakes and the BTC, he will be definitely in contention. Another horse punters will be keenly following is John O’Shea’s Knyodart. As mentioned above, the best racebook to place a bet on the 2014 Doomben 10000 is Bet365.com, who will offer the best odds on the race. When visiting Bet365.com, click on ‘Horse Racing’ in the left sidebar and scroll down to the Antepost section of the page, where you will find the markets for this race and many more. The Doomben 10,000 is a Group 1 race held at Doomben Racecourse in Brisbane, Australia run over a distance of 1350 metres. The race is open to horses aged three and older and offers a purse of $650,000. The 2013 edition of the race was won by Epaulette.